THEY are addicted and happy to admit it. 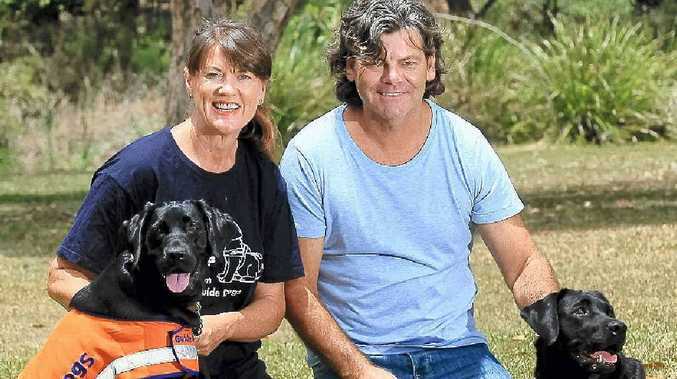 Currumbin couple Helen Croucher and Matt Perry will soon take on their fifth puppy for Guide Dogs Queensland. "We started by thinking of getting a pup and we saw the Guide Dogs advertised in the paper and we thought 'perfect' because for nine months you get a dog," Helen said. "It's just slightly different to having a domestic dog. "They have to be respectful at all times and they are not allowed to jump up on the lounge or bed." The pups like Quella and Opal live with "foster parents" like Helen and Matt from 10 weeks until about 12 months of age with all equipment, food and support provided by GDQ. Each dog costs about $30,000 to breed, train and place with a person who is blind. "We hand Quella back in December and she'll go back to Guide Dogs in Brisbane to start her formal training," Helen said. "Opal will have approximately three pregnancies with Guide Dogs. "We think Opal's the Rolls Royce and while we'd be happy with any puppy, we'd just love to raise one of hers, so we are keeping our fingers crossed." GDQ relies on fundraisers like its Christmas appeal to raise enough money to allow puppies to become life-changing companions. To donate to GDQ's Christmas Appeal go to www.guidedogsqld.com.au or call 1 800 007 460. To apply to be a Puppy Raiser call 07 3261 7555.